Received 5 May 2010; revised 17 June 2010; accepted 20 June 2010.
have been forced to tighten up plant discharge regulations. tion-reneutralization, oxidation and biological treatment. surface as a result of oxygenated functional groups, e.g. 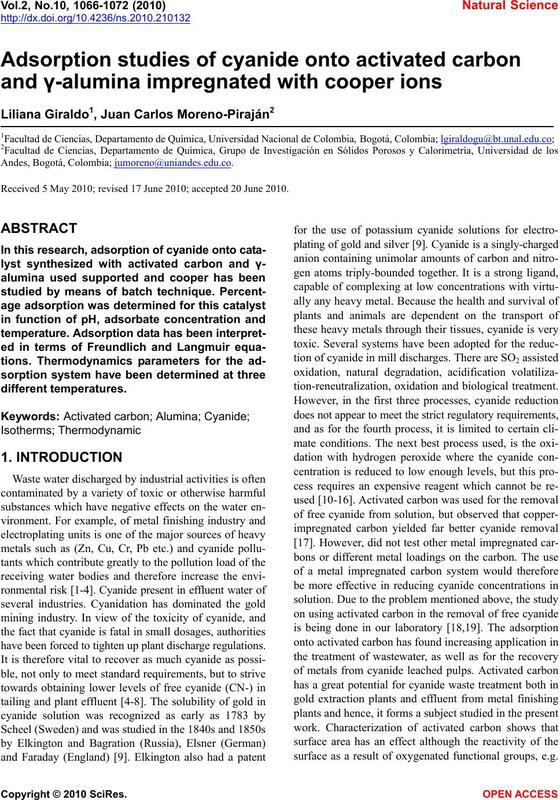 catalyst for the removal of cyanide for dilute solutions. ergy of adsorption have been calculated. pared by dissolving Sodium cyanide in distilled water. solution varied between 10 to 80 mg.L-1. face area of 1567 m2.g-1. for 10 hours. The final pressure was less than 10–4 mbar. Textural parameters were derived from adsorption data. lowing the protocol detailed by Giraldo et al. [22,23]. surface is zero corresponds to the PZC. water bath for a known period of time (i.e. 30 minutes). total pore volume for both materials. Figure 1. Pore distribution for Cu-AC. Figure 2. Pore distribution for Cu-A. Table 1. Textural parameters of catalyst. agreement with its hysteresis loop. Figure 3. PZC for Cu-A catalyst. Figure 4. PZC for Cu-AC catalyst. AC and Cu-A respectively are shown in Figures 5 and 6. Cu are also present in the spectra, specially the last one. Table 2. Physicochemical characteristics of the catalyst. Figure 5. DRX for Cu-AC catalys. Figure 6. DRX Cu-A catalyst. and 50 ppm for the synthesized catalyst. on the catalyst surface Cu-AC on the Cu-A. pacity for Cu-AC, i.e., pH 7- 8.0 (Table 3 and Table 4). 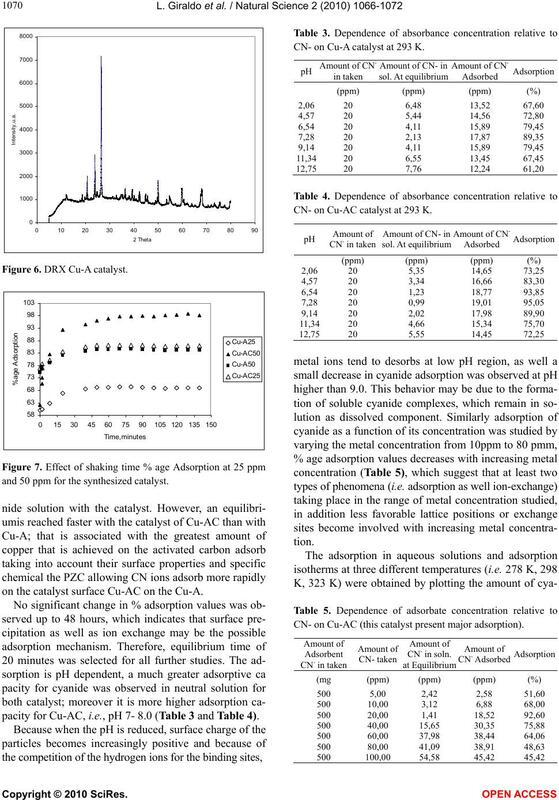 CN- on Cu-A catalyst at 293 K.
CN- on Cu-AC catalyst at 293 K.
CN- on Cu-AC (this catalyst present major adsorption). 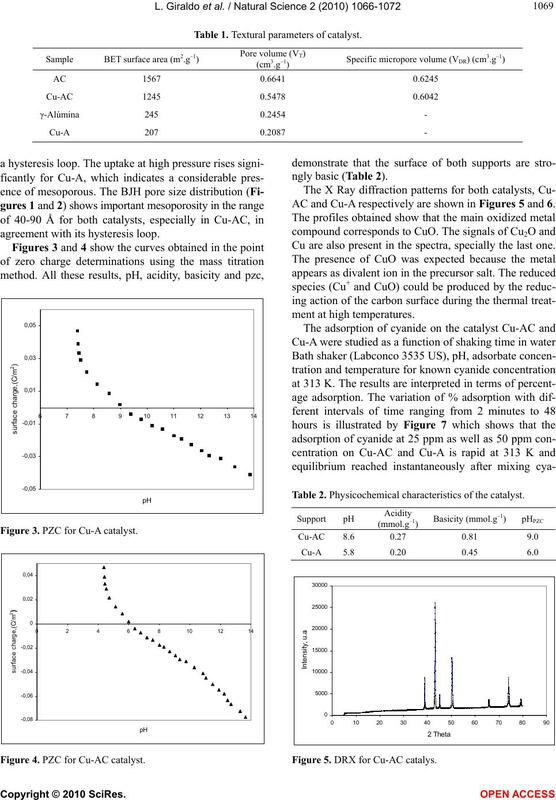 describe experimental data for adsorption isotherms. and Figure 4 (the isotherms linearizated not shown here). 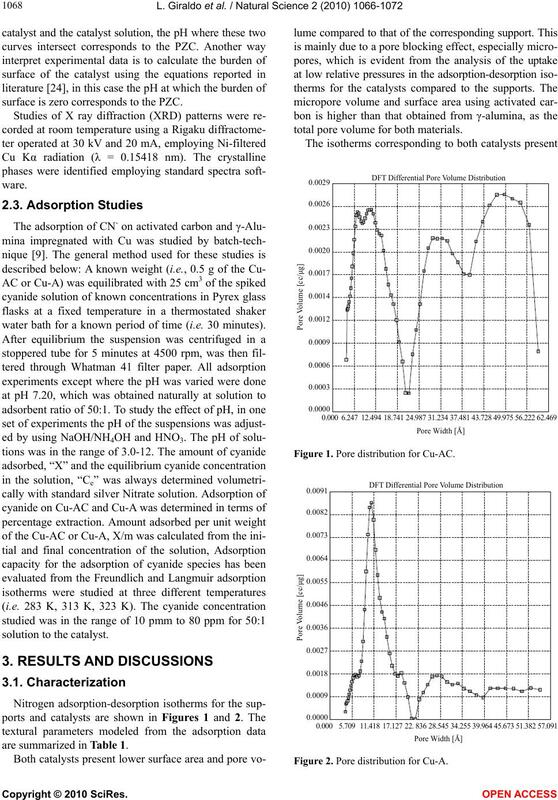 better the adsorption data (See Figure 8). lyst is low and easily available in country. ture of the adsorption process. Andes for the partial financial of this research. handbook. AP Professional, New York. of Heterogeneous Catalysts, Elsevier Science, New York. dustrial Engineering Chemistry Research, 26, 588-597.
plexes: Part A: Inorganic ligands, Pergamon Press, Oxford. 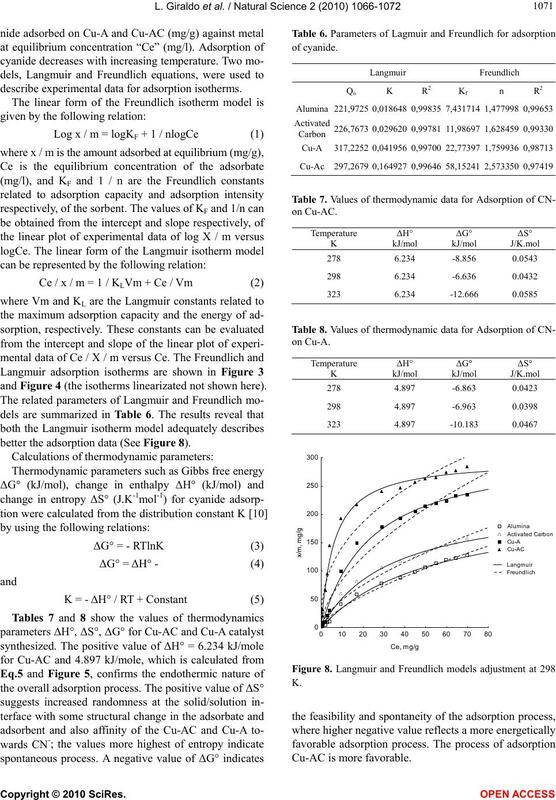 Tien, C. (1994) Adsorption calculations and modeling. lurgy in extraction process, CRC press, Florida. ode. Plating and Surface Finishing, 81, 70-81.
metals, Reviews in Inorganic Chemistry, 11, 177-182. 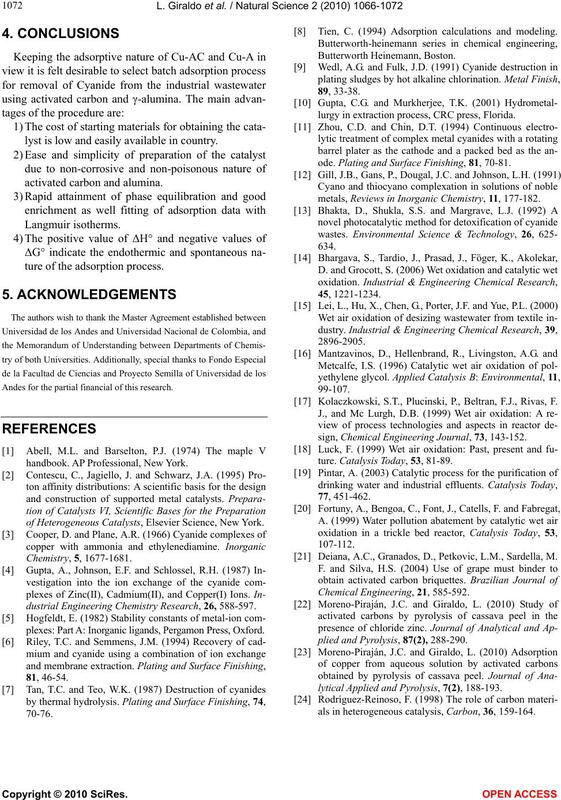 Kolaczkowski, S.T., Plucinski, P., Beltran, F.J., Rivas, F.
sign, Chemical Engineering Journal, 73, 143-152.
ture. Catalysis Today, 53, 81-89. 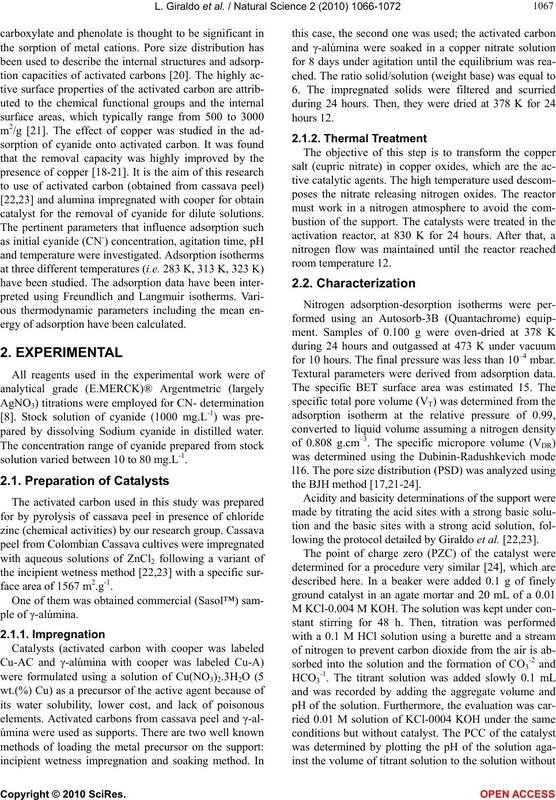 Deiana, A.C., Granados, D., Petkovic, L.M., Sardella, M.
plied and Pyrolysis, 87(2), 288-290.
lytical Applied and Pyrolysis, 7(2), 188-193.
als in heterogeneous catalysis, Carbon, 36, 159-164.